Personalized feed reader my6sense has launched in beta today on Google's Android platform, and can be downloaded freely from the Android Market now. My6sense made some ripples in the vast ocean of iOS apps when it launched last year; because it takes the simple concept of RSS and social feed reader and gives it some "digital intuition" so your feed is more relevant to your interests. The main streams of content in my6sense come from Facebook, Twitter, Google Buzz, and Google Reader, and once you enter all your feeds, you start using the app as you would any other feed reader. The first few times you use the app, it's really quite similar to any other feed reader. The real benefits come later. Once you start checking your feeds and clicking on posts or links that interest you, my6sense starts to rank and prioritize feed items based upon how useful a bit of information may be to you. Eventually, the items you're most likely to be interested are the first that are suggested to you. My6sense does not give you the ability to create tweets or feed posts from scratch, unless they're linking to some content in your stream. This takes some getting used to, but it ultimately helps the app focus on providing a more relevant stream. This relevancy is represented as the "digital intuition" progress bar shown on the home screen. As you use the app, this bar rather quickly fills up and ranks you: "Explorer, Excelling, Mastering, Transcending, and Lord of the Senses." Though it's not much in the way of a game, it definitely serves as a reward for honing the app's suggestion engine. One of the most interesting aspects of this beta is just how different the Android version is from the iOS version. 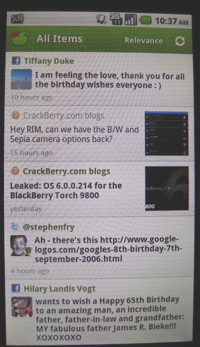 The app includes a dashboard widget which looks very similar to those that come with the Android Twitter and Facebook apps. 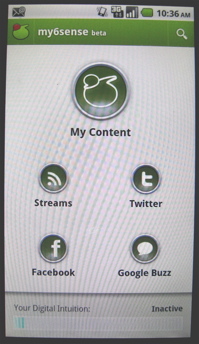 It shows one feed item at a time and can be scrolled through by pushing an arrow button on the widget. 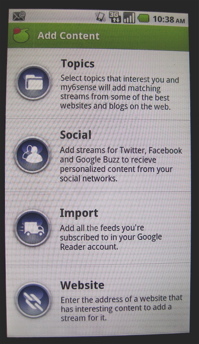 Additionally, the app presents a greater amount of options to Android users for browsing feeds. In the iOS version, there are two tabs, one labeled "relevance," and one labeled "time," and along the bottom, there are buttons for top messages, feeds, and user profile. Android users have these options, but can also sort through their feeds by individual service, feed source, or user. "Android customers have made their platform choice to avoid limits on what they can or cannot do with their phone, and we too want to avoid limiting your experience to traditional streams based on time or simplistic filters," Barak Hachamov, Founder & Chairman of my6sense said. Aside from the initial time investment required for training the Intuition Engine, my6sense is a handy app, and the feeds it creates are more relevant without being too exclusionary. It can be downloaded for free in the Android Market right now.